Ben came home from the summer camp he’s teaching with a story about one of the girls in his camp. She’s allergic to dairy, eggs, and peanuts, and has to eat separately from the rest of the kids in the camp in a “peanut-free zone”. I can’t even begin to imagine how hard that is — at least with my allergy, I could sit next to kids eating things that would’ve harmed me. Food, in our society (and from what I can tell, most societies), is a social thing as well as something for nourishment. When we get together with people, we talk about meeting up for lunch or dinner, or grab a cup of coffee. For kids in public school systems or very busy summer camps, lunch time might be the only unstructured social time they get with their classmates. And that means that for those of us with allergies, it’s not just eating that’s harder, it’s socializing. I do a lot of contract work, which means I eat a lot of first meals with coworkers. The allergy comes up in conversation. A LOT. I don’t mean to be one of those people who’s always talking about my digestive tract, but when someone suggests we go out for pizza, they keep pushing for answers when I say I’m not up for joining them there. Or the number of times I’ve been offered cake or cookies, and when I politely decline, I get asked, “What, are you on some sort of a diet?” Yes, I’m on the thinner side of the spectrum (a result, I would wager, more to do with a diet low in saturated fat, rather than due to a genetic predisposition or all that exercise I avoid), so when these middle-aged women scowl at me with their slowing metabolisms, criticizing me for a diet they think I’m on and don’t need, a lot of the time I will speak up and tell them it’s because of an allergy (although, more and more lately I stay silent). When we go to restaurants, I’m used to playing twenty questions with the waiters just to find out what I can safely order. I deal with a lot of that crap when outside the house, but now that I’m an adult, I can declare our house a Dairy-Free Zone. Okay, so it’s not a hard and fast rule, and Ben will occasionally bring something home that’s his to eat, like a tub of yogurt from the cows I nearly went to college with or leftovers from a restaurant. But for the most part, he’s voluntarily restricted his own dairy consumption, which means very little in our house. Come to think of it, we lost most of the contents of our fridge from the power outage, and I don’t think any dairy has entered the house since. As a kid, it was a lot harder. At home, my parents kept dairy products for themselves (why shouldn’t they? As adults, we have the privilege of choosing our own food). At school, I ate my packed lunches because I could never have anything from the school cafeteria. And in elementary school, the lunch time teasing was pretty bad. I remember being chased around the lunch room with cartons of milk, having drops of milk flicked at my bare skin, string cheese wiggled in my face. Kids are really cruel about things they don’t understand, and in big settings like a school cafeteria, it’s really hard for the five adults present to keep an eye on three hundred socializing kids (had they even understood what was going on, and at that point, I’m not so certain they did). So when Ben told me about the seven year old girl with the food allergies, who had one classmate who could sit with her because of the peanut allergy, but then shook a pudding container in her face and wiped cheese on her leg? I cried, and I don’t think it’s just the hormones this time. I thought back to seven-year-old me and what I so desperately needed to hear. Being a kid with allergies is so hard. All the grown-ups think they’re helping by giving you special cheese and a special plate of things you can eat. And yeah, sometimes that stuff is exciting, like when you go to a vegan restaurant and you can order anything on the menu. But special is only special when it’s, well, special. It’s only exciting when it’s different, when you can spend most of your time being normal. I can’t even count the number of times I cried myself to sleep because I just wanted a stupid ice cream cone like everyone else. Or the times I made myself sick because “well, a little bit will be okay”. But you know what? What I eat now is normal. In our house, our normal “butter” is Earth Balance. When I say “please pass the milk”, it’s usually soy (although sometimes coconut or almond). And if I want, I can have ice cream for dessert, because we bought some at the store and it’s okay. I can open our refrigerator and eat anything I want to. And it’s No. Big. Deal. And those decadent dairy-free desserts I make for myself? Most of the people I share them with can have dairy no problem, and don’t even care that what I made is cow-free. At Thanksgiving, my dairy-free pumpkin pie is regularly topped with whipped cow-cream. The raves I got for my dairy-free pumpkin cheesecake! And you know what else? Our wedding meal was totally dairy-free. And most people never even knew. So hang in there, kiddo. It’s hard now, I know. But when you’re done with school and living on your own, you get to plan your own meals. And then whatever you choose to make is normal. 30 weeks, and probably the most domestic I’ve been all pregnancy. I spent most of the day yesterday in the kitchen. Barefoot, of course, which caused much amusement for everyone else. See, in our family, when holidays and events occur at inconvenient times during the week, we move them. So my birthday got relocated to Saturday this year. It was a last-minute thing, so only a few people were able to join us, but it was still really fantastic. I decided on Monday to bake myself the World’s Most Ridiculous Cake; not to be satisfied by merely one complicated recipe, I instead adapted from TWO complicated recipes. Why make something simple when you can instead spend ten hours baking something that you will then judge to be Not Good Enough? Don’t get me wrong, the cake turned out great. By which I mean so decadent it almost killed us, but this is not the sort of thing we do often, after all. But it’s actually only my second layer cake ever, so the frosting did not go on quite as smoothly as I hoped, despite using the much-beloved “crumb coating” technique of frosting (I have a couple thoughts, but that is neither here nor there). It really was the perfect way to spend a birthday, though. I clearly need more creative outlets in my life, and the cake helped with that a lot. And then getting to share it with a few good friends who I don’t see nearly enough? That made it all just that much better. I told Ben as we went to bed last night, crashing hard from the sugar rush, that I couldn’t have asked for a better birthday celebration. Just to be thorough, I’ll leave you with a parting image of the damage to the cake. It took FIVE of us to eat that small amount. Yes, that would be not quite a quarter of an 8″ cake. 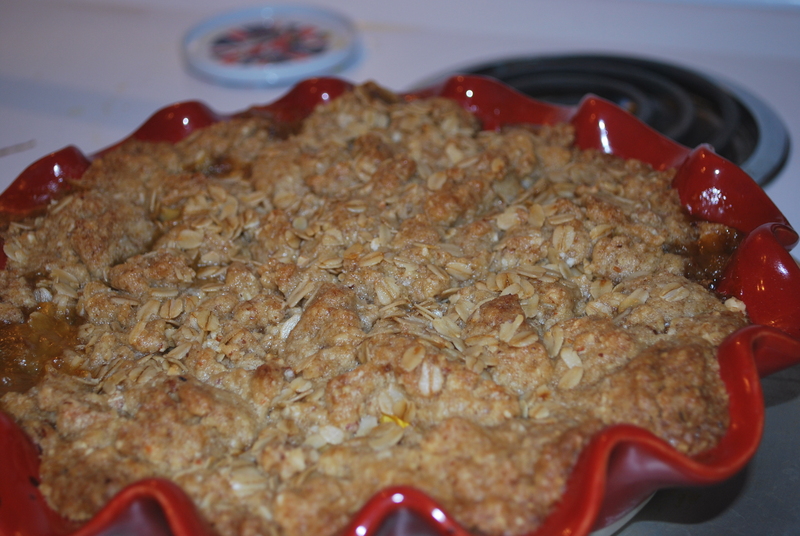 The lovely peach crisp, adapted from a recipe in The Art of Simple Food. Only with a splash of bourbon, because cooked peaches, like a Kentucky grandmother, need a splash of bourbon to bring out true excellence. Wait, what? Ben has started teaching summer camp this week, which he’ll be doing for most of the rest of the summer. I’m still at home trying to justify my continued existence (my grandmother tells me I’m gestating, which is a full-time job. I still feel lazy). Which means I’m trying to play housewife again. In case you don’t remember how this went last time, let’s just summarize with the fact that I fired myself after a week. So task one as a housewife: make sure we have something to eat for most meals. That means meal plan! What did I plan this week to cook for us? The most decadent birthday cake possible, and a peach crisp. Yes, that is actually all I managed to plan for meals. Yes, I should probably be fired again. Okay, to be fair, this time at least I bought us fresh veggies. And Ben is really excited about the baking projects, so he’s currently refusing to take my resignation. All of which means I’m doing somewhat better than last time, so I have another week to get my act together before this experiment turns disastrous. So next week’s goal: plan more veggies, and maybe work some meat into the equation. P.S. Turns out Ben brought his leftover meatballs home from lunch, which meant we had TWO portions. So dinner became meatballs, buttered noodles, and those fabulous corn ears from the market. Not too shabby! Everybody I talk to, and I mean, like, EVERYBODY, seems to feel the need to tell me what a terrible idea it is to be pregnant during the summer. A little math for you. Pregnancy is 37 to 42 weeks. Depending on how you calculate it, that’s either 9 or 10 months. The year consists of 12 months, of which 3 are considered summer. So, theoretically, if you conceive PROMPTLY in early September, AND you have a regular, average-length cycle which falls at the appropriate time in the month, AND the baby doesn’t decide to hang in for 42 weeks, then the baby will be born sometime in late May. And that is the ONLY way to avoid being pregnant during the summer. 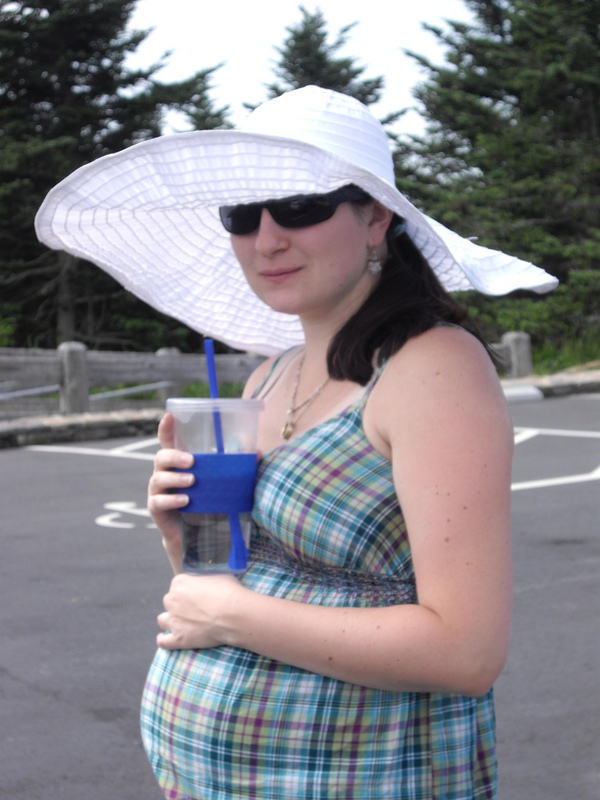 Okay, now I know what they mean by “pregnant in the summer” is “visibly round and pregnant while it’s hot outside”. Most people forget that the first trimester even exists, after all. But here’s the thing: even if you’re not pregnant, it’s still hot in the summer. And that late May baby? Well, now you have a tiny baby who’s complaining about the heat, instead of an adult woman who has been through many summers and knows how to dress for the weather. Or turn up the A/C. Or put ice in her water. I could be wrong here, but I’m pretty sure you’re not supposed to put ice cubes in baby’s milk. And if it’s breast milk, then… Yeah, let’s not go there. Ow. Don’t forget the perks of summertime — the pools are all open, you can wear almost no clothing and it’s socially acceptable, and frozen treats are available at every corner. Really, if I’m going to be going through a period of my life when my body temperature is unregulated, that sounds like a pretty good deal to me. Besides, we’ve been having a 100-degree heat wave this July. If I’m having terrible hot flashes of pregnancy, I gotta say, I don’t think it’s any worse than anybody else this year. Ben has more trouble sleeping through the warmer nights than I do. And our little girl has very graciously decided not to become a little tiny furnace. There was one day I thought she might, but it was 102 outside and we had no electricity in the house, so it could have just been me feeling warm. It’s none of your damn business when we decided to have our baby. The “Service Areas”, which consist of a single, overpriced, run-down gas station with typical gas station bathrooms. Putting a plastic plant in for ambience does not make up for the fact that you haven’t mopped since last Christmas and that the purse hook is broken. Stop signs at the end of the merge ramps. Seriously, people? Just because car manufacturers advertise how fast a car can go from zero to sixty does not mean I want to test it just because I had a fetus step on my bladder. The hotel swimming pool and it’s non-functional filter. When I go swimming in a chlorinated environment, I have certain expectations. Like being able to see my feet in the 3′ depth and not getting choked by the tiny little bugs that have drowned themselves in the filth that is the hotel pool. This isn’t just me being pregnant and finicky — there were two children, at about that eight to eleven gee-I-love-dirt phase, who not only commented on the water being gross, but subsequently got out and decided to sit on the lounge chairs until their mother came back to retrieve them. Did I mention there was a dead bug firmly attached to the inside of our shower curtain? The complimentary hotel continental breakfast, which consisted of pencil-eraser scrambled “eggs”, soggy cold potato wedges with onion and peppers, and Canadian “bacon” with sugar-free maple flavoring that drooped off the fork. Even the orange juice had an off taste. Figuring even they couldn’t manage to screw up a banana, I went to check out the fruit… And found a grey, spotty mush of a banana peel that theoretically contained fruit. Ben then took me to Brueggers, where I got a lovely bagel sandwich and some real juice. I’m sure people who live in Connecticut or love Connecticut or just like to be contrary would like to point out to me that several of these points are specific to the hotel we were in. I would like to make it clear that I am cranky and really don’t care. I had never been to the state before, and this is the first impression it chose to make. Now I can check it off my list and Be Done With It. Before we began the trek up Mt. Mitchell in Asheville. Did I mention it was nearly 100 degrees outside? And that we’d been in the car for about two hours? And I was 26 weeks pregnant? I’ve been getting a lot of books on pregnancy and childbirth from the library. It’s a great way to try out a book and see if it’s worth owning, or in the case of many, deciding it’s a great reference, but not worth a second read. For instance, Our Bodies, Our Selves: Pregnancy and Birth turned out to be exactly the book I wish I’d had starting in the first trimester. In fact, as I said to one woman who mentioned to me that she was in the pre-conception phase, throw What to Expect out the window and get this book instead. It has radical concepts like diagrams and non-judgmental medical advice. I mean, it doesn’t compare your fetus to the produce department on a weekly basis, but it does have a diagram that shows where your liver got shoved off to. And instead of all that “sympathy” over nausea (“Morning sickness? Talk about all day sickness! Ugh, right?”), it actually gives strategies for relieving it. So yeah, good book. But, honestly? It’s a great library book, because I really only need it once or twice. I digress. I had found a new book I wanted to look at (actually, one that was noted in Our Bodies, and by the same author as another we’d read and adored, The Birth Partner). The library had it, but not at our branch, so I placed a hold/transfer request on it before remembering I was going that afternoon to the farmer’s market at another branch. Because pregnancy makes you stupid. So before hitting the market, I stopped in the library to talk to the lovely ladies at the desk about the hold and to see if I could get the book directly, saving them a transfer. Turns out the hold request I saw online was for the OTHER person who’d requested the book and mine hadn’t been processed yet. Oh well. 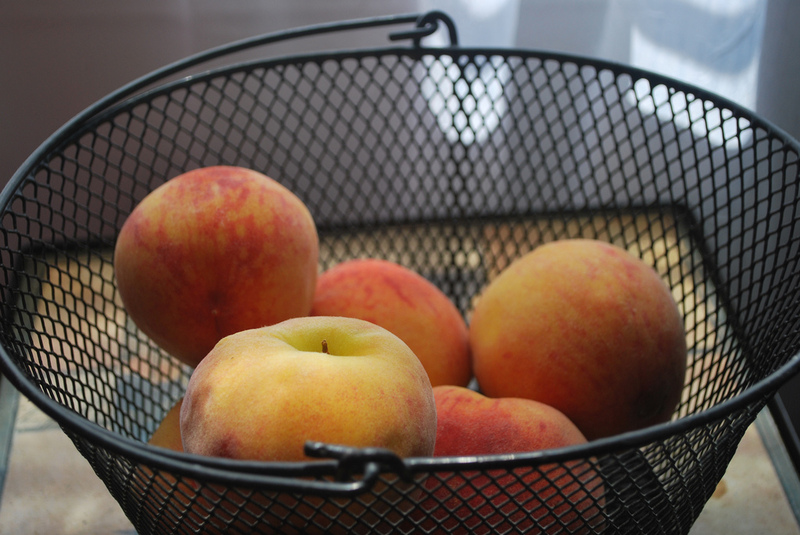 I still got peaches, so it’s hard to be upset. At any rate, the point of all this is my walk into the library. 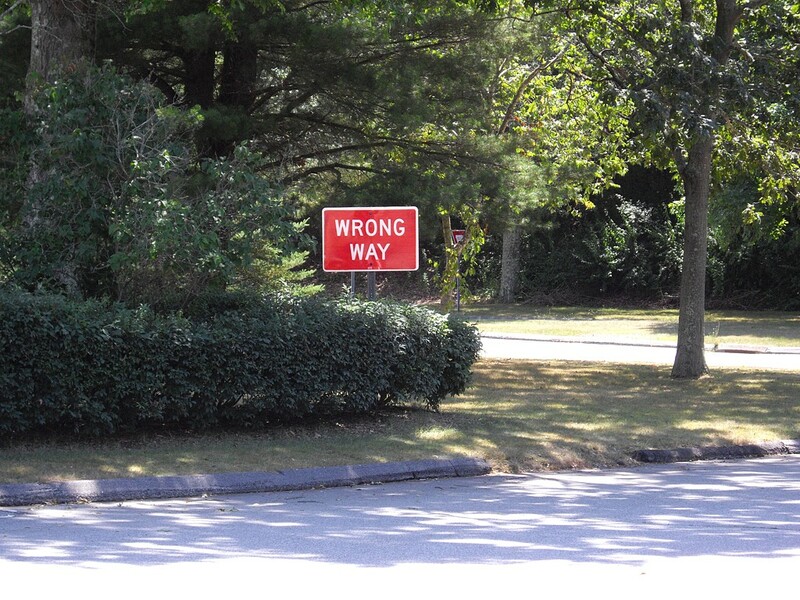 I wish I could find a picture of the front entryway, because that makes the whole thing make a lot more sense. Imagine a big, wide hallway with mirrors along the left wall. There are also glass panels perpendicular to the mirrors in such a way that throws off your sense of perspective, but without distorting the images. The effect is that of seeing twice as many people in the entrance, but walking in the opposite direction. So as I entered, I caught a glimpse from the corner of my eye of a very pregnant lady exiting the library. I probably took at least five full steps before I realized that image was my own reflection. Just for clarification: I didn’t recognize my own reflection while walking past a mirror. So when I had that first real peach of the season yesterday afternoon, and it was so good I completely forgot I was pregnant for three whole minutes? Yeah, there’s a reason I wrote about that part of the day instead.